A Real-time TV Display Screen Content Management and Marketing Solution! Display pricing, promotions, products specs and other information utilising the actual TV screens that are for sale! Move away from messy price tickets to a modern and visually engaging pricing display solution. 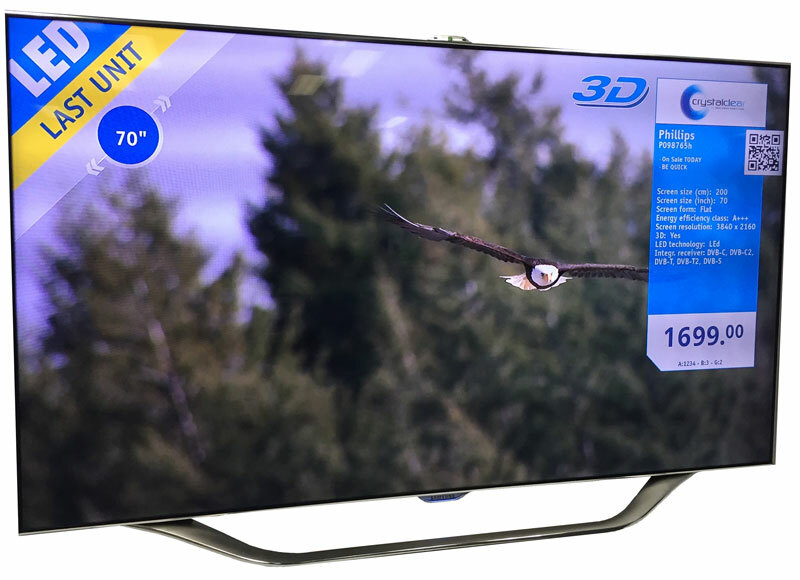 All information and content on the TV screens can be updated via a mobile in-store APP or via head office providing consistent pricing and information across multi-store environments. Say goodbye to price tags, paper wastage and old school marketing. Say hello to a smarter time efficient content and marketing display screen solution. Manage special offers, pricing, specs and other content and have it display on your retail TV display screens targeting your customers at the point of sale. Save time and money with the TV-L – the digital price tag solution directly on the TV screen.